Mennonite Brethren Bible College Administration Building, 1951. 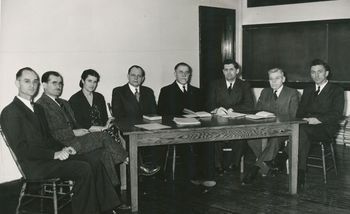 Left to right: J. H. Quiring, Ben Horch, Esther Horch, H. H. Janzen, A. H. Unruh, J. B. Toews, Heinrich Wall, and John A. Toews. 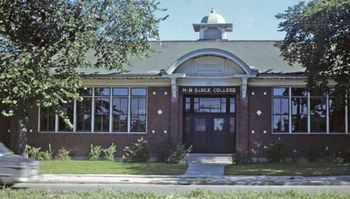 The Mennonite Brethren Bible College (MBBC) was the first Mennonite Bible college in Canada and was established in Winnipeg in 1944 as the national college of the Canadian Conference of the Mennonite Brethren Church. Its purpose was to provide theological education and practical training for ministers, missionaries, Bible school teachers and workers in local congregations. The first president was Abraham H. Unruh, who served in that capacity for only one year and was succeeded by John B. Toews. Cornelius A. DeFehr was one of the primary early supporters of the college. Other well-known presidents and teachers include Heinrich H. Janzen, John A. Toews, Frank C. Peters, Jacob H. Quiring, Henry Krahn, and David Ewert. The school soon established a solid academic base and many well-known leaders emerged from this institution. In addition to training in theology and missions, the college was soon recognized for its strong music program, initially under the leadership of Benjamin Horch. William Baerg served as head of the Music Department for the longest period of time. In the early years of MBBC the majority of students came with specific ministry goals, but by the 1960s students increasingly came for a more general education and formation of a Christian worldview. The college also constantly revised its programs and sought accreditation for university level training. In 1961 MBBC entered into an affiliation agreement with Waterloo Lutheran University (now Wilfrid Laurier University) which enabled students to receive the equivalent of two years of university credit toward a three-year Bachelor of Arts degree from the University. In 1970 a new agreement was concluded with the University of Winnipeg which provided for the cross-registration of most courses offered by MBBC. It also provided University of Winnipeg students with the opportunity to study music and other subjects at the college. When seminary training became increasingly necessary for pastoral ministry the college also began to offer a seminary program. A Bachelor of Divinity program was begun in 1963, but this was discontinued in 1972 in favor of joint seminary training with the Mennonite Brethren in the USA and located in Fresno, California. In later years, however, provision was again made for some seminary training as part of the Theological Consortium involving several institutions in Winnipeg, as well as under a cooperative arrangement with the Mennonite Brethren Biblical Seminary in Fresno. In the 1970s and 1980s MBBC gradually lost the support of part of its constituency, especially in British Columbia (BC) where a cooperative educational effort between the large BC Conference of Mennonite Brethren Churches and the Conference of Mennonites in BC was growing. Various attempts were made to involve an alternative constituency in the ownership and governance of MBBC. In 1992 Concord College was established, at first supported by the Mennonite Brethren conferences of four provinces (Alberta, Saskatchewan, Manitoba, and Ontario). This arrangement was also temporary and in 1998 Concord College was transferred to the Mennonite Brethren Church of Manitoba. Discussions with other Mennonite educational institutions regarding the possibilities of closer ties or a joint educational venture took place over the course of MBBC's history, especially in the 1980s and 1990s which led to the founding of Canadian Mennonite University (a federation of three colleges -- Canadian Mennonite Bible College [CMBC], Menno Simons College and Concord College) in September 2000. College Bulletin: Fortieth Anniversary Edition (July 1984). Doerksen, John G. "Mennonite Brethren Bible College and College of Arts: its history, philosophy, and development" Ph.D. diss., Univ. of North Dakota, 1968. Twenty-fifth Anniversary: Publication of Mennonite Brethren Bible College, 1944-1969. Winnipeg: Mennonite Brethren Bible College, 1969. Dueck, Abe J. "Mennonite Brethren Bible College (Winnipeg, Manitoba, Canada)." Global Anabaptist Mennonite Encyclopedia Online. July 2011. Web. 19 Apr 2019. http://gameo.org/index.php?title=Mennonite_Brethren_Bible_College_(Winnipeg,_Manitoba,_Canada)&oldid=134020. Dueck, Abe J. (July 2011). Mennonite Brethren Bible College (Winnipeg, Manitoba, Canada). Global Anabaptist Mennonite Encyclopedia Online. Retrieved 19 April 2019, from http://gameo.org/index.php?title=Mennonite_Brethren_Bible_College_(Winnipeg,_Manitoba,_Canada)&oldid=134020. This page was last modified on 11 May 2016, at 22:48.